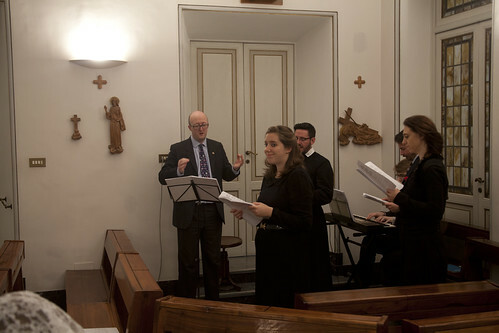 When not in the Chapel of the Choir in St Peter's, the FIUV General Assembly (and the LMS Rome Pilgrimage which was timed to coincide with it) had Mass and Vespers and Benediction in the chapel of the Convent hotel where the General Assembly took place, the Casa Maria Immacolata, which is close to the Vatican. 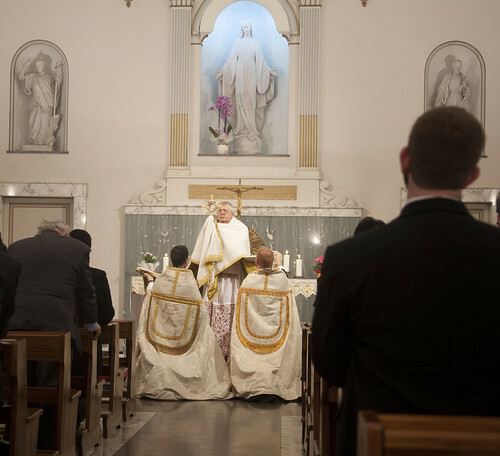 It was in this chapel we had Mass on Sunday; it was celebrated by Mgr Gordon Read, the Latin Mass Society's National Chaplain; since it was Sung we had the Asperges at the beginning (below). On Saturday evening, with Archbishop Pozzo, they sang Magnificat sexti toni by Vecchi in Vespers, which alternated with chant, and Ave verum corpus by Byrd for Benediction. For Sunday Mass we had Mass for Four Voices by Byrd, Panis angelicus by Franck, and Rosa Mystica by Fauré, arr. Knowles & Turchetta. On Sunday evening we the Vespers hymn Lucis creator optime alternating chant with a polyphonic setting by Washington, which was wonderful, and another polyphonic Magnificat, Magnificat Tone 1 à 4 by Viadana, At Benediction we heard Ego sum panis vivus by Byrd. The musical side of the liturgy was tremendous, thanks to a lot of work from our dedicated professionals; Fr William Barker FSSP is also to be thanked for MCing the more complex liturgies, including Vespers with Archbishop Pozzo. Mgr Read officiates at Vespers. 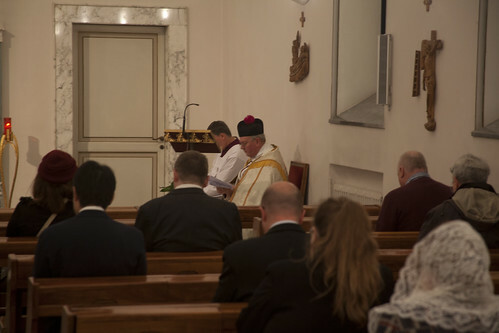 Fr Michael Brown, the other priest with the LMS pilgrims, said Low Mass at a side altar in St Peter's one morning, and I got a few photographs of him. 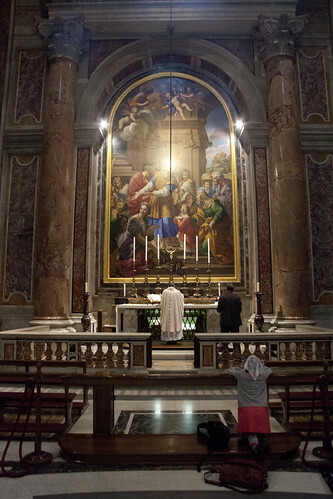 He used the Chapel of the Presentation of Our Lady, and said Mass over the tomb of St Pius X who is buried there. Hello Joseph. I have a question about the last photo. 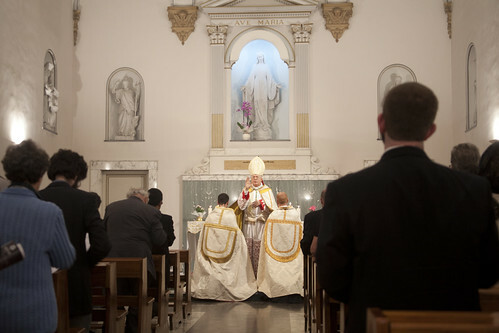 This is a Low Mass as you said, and I only see one man in a suit at the sanctuary, and one laywoman in the "pews". 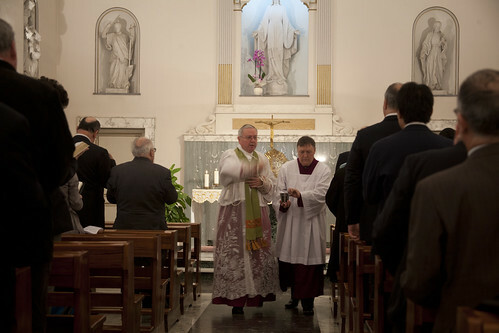 While I have heard that Opus Dei has laymen in suits for their masses at servers, this looks odd for a Latin Mass. Can you explain further this situation? 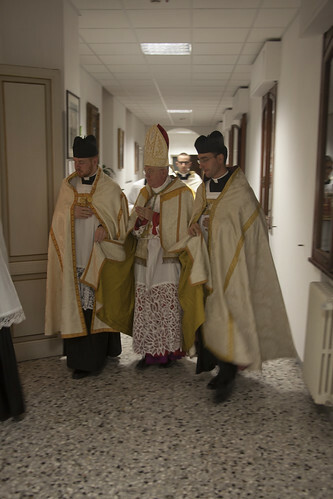 I always thought a server had to have the requisite surplice and cassock for the TLM, in order to serve. Also was the suited individual allowed to say the servers' responses, or did you have to do those in emergency with the laywoman doing them, the "Straw layperson/server" situation? I don't quite get all of this picture. Can you clarify? Thank you and pax. I don't know the exact circumstances in which this Mass was arranged but it was immediately before the Solemn Mass we had in the Chapel if the Choir (which is next door). Fr Brown needed to say a Low Mass and no-one free had a cassock and cotta with him. They are fitting but not absolutely necessary for the server. When push has come to shove I have myself served in ordinary clothes. It was not a public or scheduled Mass; my family, arriving early for the Solemn Mass, attended the last part of this Mass (my wife and one of my daughters can be seen in some of the photos). Thank you for the clarification Joseph. God Bless. Thank you for posting such beautiful photos Joseph as a reminder of the Rome Pilgrimage. I'm so pleased I was able to go - the memories and music will live on in my mind for a long time. As you say the acoustics in the Chapel were indeed excellent allowing the heavenly voices to soar and envelop the small space of the Chapel. My favourite music was at the Sunday Mass. Thank you music makers for your great efforts in arranging and performing such exquisite music over the five days.